Television bosses to rename Daybreak? Desperate bosses are considering renaming failing breakfast show Daybreak, in a last-ditch attempt to win over the audience and stop the steady flow of viewers switching off or switching over, causing viewing figures to plummet. The cursed show has been haemorrhaging viewers in recent weeks, with figures dropping as low as 500,000, prompting producers to hold emergency crisis talks over how to save the sorry show. And it seems changing the name, and rebranding the show could be one of the options, despite the colossal cost. ‘High-level meetings have been held about what to do to halt the crisis. Changing the name has been discussed,’ one insider told the Sun. Producers have already made changes to the sparse Daybreak set in an attempt win back their audience, adding flowers, plants and even tea and coffee cups to brighten it up. And there has even been talk of the experienced I’m A Celebrity… Get Me Out of Here team taking over, to work their magic on the show and halt declining viewing figures. There have also been rumours that Christine Bleakley could be facing the axe, after she has proved very unpopular with the morning audience, but ITV has consistently denied the claims. ‘Daybreak has a first class presenting team and any suggestion that it will be changing is completely untrue,’ a spokesman hit back in a statement. 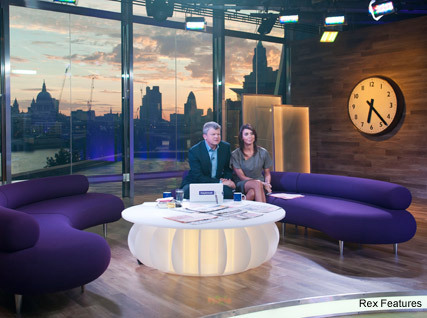 ‘ITV has made a long term investment in new breakfast programming and, after over five years of decline for GMTV, Daybreak is already closing the gap in year on year decline after just one month, with housewives and children, male and younger audiences. And Christine herself has also denied the reports, adding that the show has just been experiencing ‘teething problems’. ‘It’s been a strange few months, it’s been rather up and down,’ she said at a recent event. ‘But we always knew it was going to be hard. We knew going in that the ratings would drop, we were waiting for it – and people are treating it like it’s something unexpected. ‘It’s always difficult to launch a new show and I’m exhausted – getting up at 3am every day takes its toll on you – but I’m not going anywhere. Would changing the Daybreak title make a difference to viewers? Let us know your thoughts in the comments box below.